Sixteen-year-old Sarah Meadows longs for "normal." Born with a port wine stain covering half her face, all her life she’s been plagued by stares, giggles, bullying, and disgust. 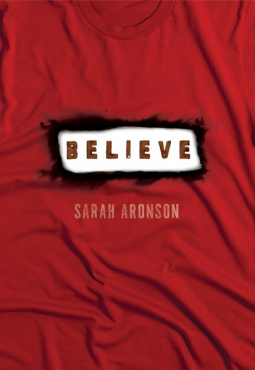 But when she’s abducted on the way home from school, Sarah is forced to uncover the courage she never knew she had, become a hero rather than a victim, and learn to look beyond her face to find the beauty and strength she has inside. It’s that—or succumb to a killer. I may have mentioned once or twice that I love Cheryl Rainfield's books (Parallel Visions and Scars). I just think she's a phenomenal author, who isn't getting enough recognition in the mainstream YA market. But that's okay. She's as she will tell you, writing the books that she needed as a teen and couldn't find. Probably because no one was willing to be that blunt and honest, and well...real...about really tough topics. This is the story of Sarah, told from both her and her friend Nick's point of view. Sarah isn't popular. She is, unfortunately, the subject of ridicule because of a large port win stain on her face. She's supposed to start treatments to lighten it significantly, but that's not going to happen now. Nick's been in love with Sarah for years, yet Sarah has never seen it (really, who could love her the way she is and besides...it's Nick.). Nick turns out to be not only Sarah's rock, but a strong support for her family while she is missing. When she's abducted, Sarah becomes the strongest teenager I've read about in any work of fiction. She is starved, raped, tortured (mentally and psychologically), and left to save herself...because her abductor is the last person any one would suspect. She, very literally, must become her own hero. And she does it beautifully. Cheryl takes characters and drops them in situations that it would be so much easier to give in to, to give up in. In a very real, and amazing way, they flourish instead. They blossom into being not only more than we could expect, but more than they ever imagined they could be--because the alternative is unmentionable. This book is a "thriller" and intense read. I read it in a sitting (much to my puppy dogs' chagrin since I ignored them) and was haunted for several days. In the end, there is hope and inspiration--just like I imagine we could easily take from Cheryl Rainfield's life story. ****BY THE WAY--This post is part of a blog tour, check out what others have to say about Stained . ALSO...I've got a GIVE AWAY! If you comment here, you'll get eBooks of Cheryl's books Hunted, Parallel Visions, and Scars. If you share or tweet this post, I'll throw your name in the hat an additional time--just mention it with a link in your comment. Disclosure of Material Connection: I received this ebook galley from Houghton Mifflin Harcourt Children's Book Group through the netGalley publisher/reader connection program. I was not required to write a positive review. The opinions I have expressed are my own. Another case of "I want to like this character, but..." There's just not enough to her to take me all the way there. 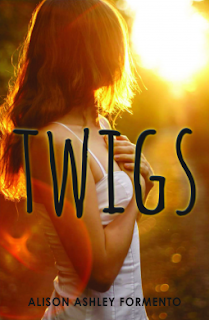 Twigs is incredibly immature, yet trying so hard to be seen as an adult. She's just not mature-acting enough to make be believe she's 18 years old. I also just had problems with the story line. Honestly, I felt like Formento had about 6 too many problems for this one girl to deal with. There's the boyfriend, the bullies coming into the store, the brother missing in the Middle East, the failing at community college during the first week, the dad-drama, the difficult mom, the know it all sister, and then the random woman she meets who's going crazy in the midst of her divorce. UGH...pick one or 2....you don't have to use EVERY idea you have. Yet, even with a million things going on, it felt like it took for-ev-er for anything to happen. I will say this...Formento is dead on with some of her descriptions. I could SEE the people, I could FEEL the environment. It just wasn't believable or even a good story line. With too many things happening and a main character I'm not sure anyone (even Coop--the new love interest) could like in real life. Disclosure of Material Connection: I received this ebook galley from F+W/Adams Media (Merit Press) through the netGalley publisher/reader connection program. I was not required to write a positive review. The opinions I have expressed are my own. When Janine Collins was six years old, she was the only survivor of a suicide bombing that killed her parents and dozens of others. Media coverage instantly turned her into a symbol of hope, peace, faith—of whatever anyone wanted her to be. Now, on the ten-year anniversary of the bombing, reporters are camped outside her house, eager to revisit the story of the "Soul Survivor." Janine doesn't want the fame—or the pressure—of being a walking miracle. But the news cycle isn't the only thing standing between her and a normal life. Everyone wants something from her, expects something of her. Even her closest friends are urging her to use her name-recognition for a "worthy cause." But that's nothing compared to the hopes of Dave Armstrong—the man who, a decade ago, pulled Janine from the rubble. Now he's a religious leader whose followers believe Janine has healing powers. The scariest part? They might be right. If she's the Soul Survivor, what does she owe the people who believe in her? If she's not the Soul Survivor, who is she? I think I snagged this book largely for the "faith healing" aspect that runs through it, and because I came across the ARC after the Boston Marathon events. Janine, while she knows she doesn't want to be famous, doesn't really know what she wants out of her life. She's learning the painful lessons about which friends to trust and believe in and that sheer "want to" isn't a substitute for passion and talent. Honestly, I didn't like Janine. She seemed to be more self-centered than many teenagers that I know (and that says a lot, because they're nearly all self-centered as teenagers). She had some redeeming qualities, but not enough for me to care a whole lot about her. She came across as whiney and demanding, but not even really knowing what she was demanding. Just an odd mix. I also felt like the book began well, but didn't live up to it's beginning. It started to drag, and I had the uncomfortable feeling that it wouldn't resolve and leave me feeling good about it. And it didn't. One last nit-picky thing. Why is she the "soul" survivor? A lone survivor would be the "sole" survivor. Is there a reason that the pretty un-religious girl is designated in this way? Aronson never tells us. Disclosure of Material Connection: I received this ebook galley from Lerner Publishing Group (Carolrhoda Lab) through the netGalley publisher/reader connection program. I was not required to write a positive review. The opinions I have expressed are my own.